Like bubbles on the sea of matter born, They rise, they break, and to that sea return. I just finished Larry Niven and Jerry Pournelle's novel, The Gripping Hand, a sequel to the science fiction masterpiece they wrote 18 years ago, The Mote In God's Eye. Both books were very good (the first a little better) but today's blog post isn't about either book. It's about a short verse on The Gripping Hand's last page, from poet Alexander Pope's An Essay On Man. 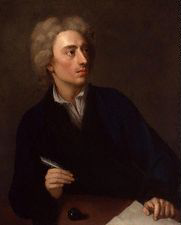 Alexander Pope was an Englishman who lived from 1688-1744. That was an era when Catholics were deeply discriminated against (the state religion was the Church of England) and Pope attended illegal Catholic schools where he learned to read and write. He became enamored of the works of Homer when he read a translation of The Iliad at eight years old. He started writing poetry at 12 (his Ode To Solitude, written at that age, was eventually published). He was first published when he was 20; his poem The Pastorals brought fame in that era before reality shows, when actual talent (or royal birth) was required to attain celebrity. But it was in his 25th year that he announced his intention to re-translate The Iliad (which Homer had composed, of course, in Greek) into contemporary English. This effort would take six volumes in as many years, and would be available by subscription. His success in this venture made him the first English poet who didn't need a "day job"—he lived off the proceeds from his writing. This is all the more delightful considering how horrified the stuffy academics of his time were at the liberties they felt he'd taken in modernizing Homer's poetry for 18th century ears. Although I could find no direct evidence that Pope was what we today would call gay, he 1) never married; 2) he had many female friends to whom he wrote "witty letters"; 3) he was sickly as a child and frail as an adult; and 4) he designed and decorated his own home that included a fabulous garden called the "grotto" and about which he said the only thing that was missing was "wood nymphs". So, you do the math. In any case, the verse I came upon in The Gripping Hand is a moving piece describing the interconnectedness of all things. I find this amazing in a piece of writing from the 18th century, when most people believed that all nature had a Divine directive to bend to the will of humanity. I was also impressed that his words, despite coming from the era of Shakespeare and being somewhat stilted due to the fact that they had to rhyme, still sound so fresh and 21st century. So, without further ado, here is Verse I from An Essay On Man, Epistle III. I have modernized the spelling and punctuation and one word; since Pope had no qualms against modernizing Homer, he has no grounds to object. Combining all below and all above. Formed and impelled its neighbor to embrace. Press to one center still, the general good. See life, dissolving, vegetate again. By turns we catch the vital breath, and die. They rise, they break, and to that sea return. The chain holds on, and where it ends, unknown.